This is a special week here at Love in the Kitchen. This week we put on our sunglasses, grab our barbeque tongs and head out to the back patio to bring you Love from The Grill! We're featuring recipes meant just for the grill all this week, along with our best tips to help make you master the grill. The ribeye usually has more fat than the other cuts. Because of that, it has the richest flavor of all the steaks. They tend to be “soft” as well as tender. They also have a great balance between tenderness and flavor. They are available as a boneless steak or a bone-in steak. 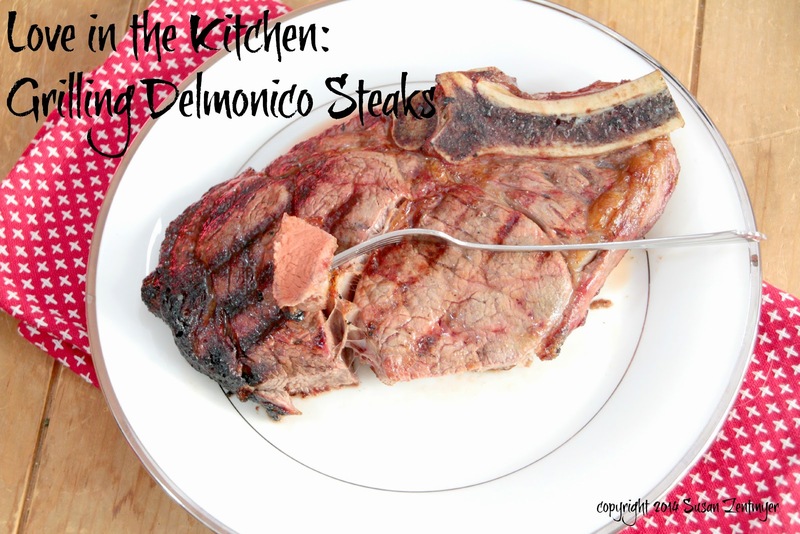 The bone-in ribeye is referred to as a “Delmonico.” It is exactly the same steak, but it still has the bone attached. 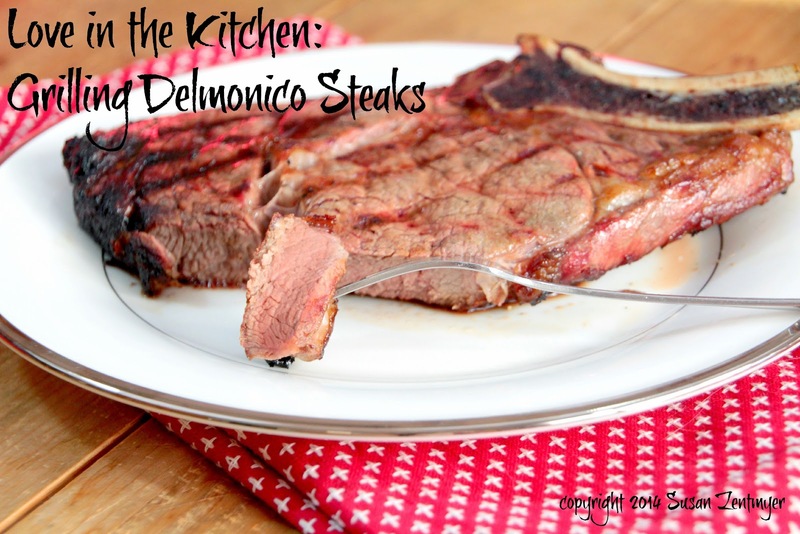 The Delmonico is one of my personal favorites, and is the one I've shown here. The filet is the most tender of all the steaks but it is also the least flavorful of all. If tenderness alone is your criteria, this is the one for you. Flavor is usually enhanced by such methods as wrapping with bacon, stuffing with bleu cheese or mushrooms, or topping with various sauces. This is sometimes referred to as a “top loin,” “strip steak,” or, in New York, as a “sirloin.” It is actually a continuation of one of the muscles that makes up the ribeye. Unlike the ribeye, the New York is primarily a single muscle. While very tender, this steak has a firmer texture than the ribeye. Choosing between these two is really a toss-up. They are both good, tender, flavorful steaks. This cut is the least tender, and has the most flavor. It is said to have gotten its name from Henry VIII, who pulled out his sword, tapped it, and dubbed it “Sir Loin.” And if you've seen images of Henry VIII, you can tell that he knew his food! 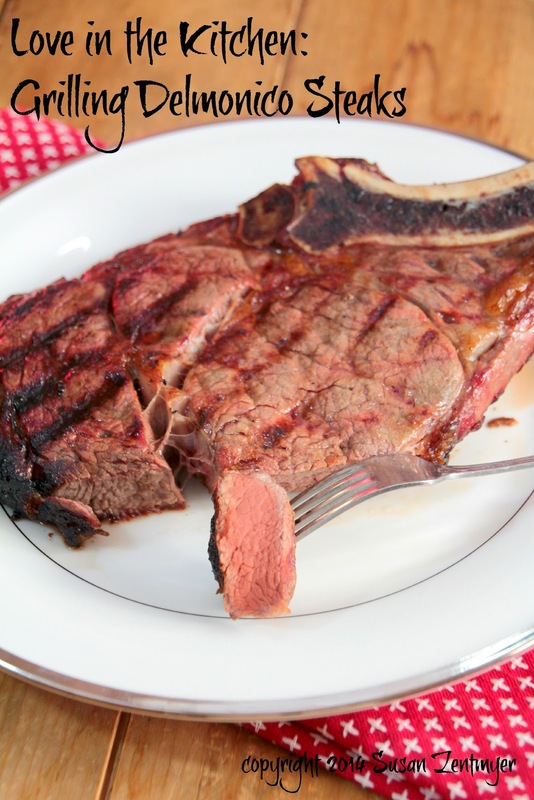 This can really be the “king” of steaks. With its inherent flavor, when you get one that is tender, it is unsurpassed. Even with proper beef, this can be tricky, but, if flavor is your criteria, this is the steak for you. These are cut, bone-in, from the loin section. The larger of the two muscles that you see is actually a “New York Strip.” The smaller muscle on the other side of the bone is the filet. The whole filet, as it sits below the spine, is large at one end and tapers down to a flat point at the other. The first few steaks that come off of this section have the larger sized filets. These are called “porterhouse” steaks. The name comes from them being the most prized steaks offered in “ale houses” in the 1800s. By definition, the filet on the porterhouse must be at least 2-¼ inches across. As you progress down the loin, the filet becomes smaller and smaller. 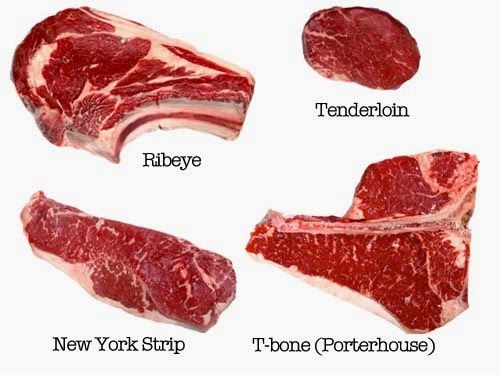 These steaks are referred to as “T-bones” because of the shape of the bone. Very simply, these steaks are simply a bone-in combination of New York/filet. You know that fat gives a steak that great flavor. But excess fat around the outside just melts on the grill and can cause flare-ups resulting in burnt steak. Trim all but a thin layer of fat from the outside of your steaks just after taking them out of the refrigerator. A good piece of meat only needs two things: salt and pepper. Seriously. Save the marinades for your London Broil or Tri-tips. Liberally salt and pepper both sides of your steak before you put it on the grill. If you’re using charcoal you’ll want very hot coals. Use the 2 second rule to test them; you should be able to hold your hand a few inches over the grill for only about 2 seconds before it’s too hot. Once they are hot, move them to one side of the grill so you can have both direct and indirect heat. If you’re using a gas grill, crank that baby to high. When the grill is preheated (on a gas grill let it heat for at least 10-15 minutes). Place the steak on the grill and do not move. Grill for 3 minutes per side over the high heat. Use tongs to turn your steak, not a fork so that you keep the juices and the flavor in the steak where it belongs. Then, check the internal temperature. If your steak needs to cook longer, move it (with the tongs) to the indirect heat side of your grill. Remove your steak when it is 5 degrees below the desired temperature - it will continue to cook once it is off the grill and you don't want it to overcook. Now you need to let your steak rest. At least 5 minutes, preferably 10. Cover it with foil. Then toss the salad, slice the bread, pour the wine... This resting time lets juices that have been drawn to the surface to relax back into the meat. You will not regret this last step. If you follow these steps, you'll have a perfect steak, every time. Check back all this week for more Love from the Grill! And head over to Love in the Kitchen on Facebook for even more grill tips and recipes to help you be the master of the grill. Thank you for the steak education! I've been getting better at grilling steaks this year but still need some help!